Benjamin Schiff Platt (born September 24, 1993) is an American actor, singer and songwriter. He began his career in theater as a child and has appeared in Broadway productions of The Music Man (2002), The Book of Mormon (2012–2013), and Dear Evan Hansen (2015–2017), receiving multiple accolades for his performance as the title character in the latter, including the Tony Award for Best Actor in a Musical. Platt's film credits include roles in Pitch Perfect (2012), Pitch Perfect 2 (2015), and Ricki and the Flash (2015). Platt signed with Atlantic Records in 2017 and released his debut studio album, Sing to Me Instead, in March 2019. Platt was born in Los Angeles, the fourth of five children of Julie (née Beren) and Marc Platt. His father is a film, television, and theater producer whose credits include Legally Blonde, Into The Woods, La La Land, Mary Poppins Returns, and the musicals Dear Evan Hansen, and Wicked. He and his family are Jewish. He attended the Adderley School for Performing Arts in Pacific Palisades, performing in productions like Bye Bye Birdie and Into the Woods. Platt attended Harvard-Westlake School in Los Angeles, graduating in 2011. He then enrolled at Columbia University in New York but dropped out after six weeks to fulfil his contract with The Book of Mormon. During his time at Columbia, he was a member of the campus a cappella musical group Nonsequitur. At 9 years old, Platt played Winthrop Paroo in The Music Man at the Hollywood Bowl alongside Kristin Chenoweth. At 11, he appeared in a brief national tour of Caroline, or Change, by Jeanine Tesori and Tony Kushner. At 17, he played Jean Valjean in Kidz Theater's production of Les Misérables. His other early roles include the role of Claude Bukowski in Columbia University's production of Hair: The American Tribal Love-Rock Musical. He has also collaborated on a workshop of Alice by Heart, by Duncan Sheik and Steven Sater, a new take on Alice in Wonderland. In 2012, Platt was cast as Elder Arnold Cunningham in the Chicago production of The Book of Mormon. The show premiered at the Bank of America Theatre on December 19, 2012, after a week of previews. The production was well received and closed on October 6, 2013. Critics lauded Platt's performance, calling him a "true revelation in this brand new Chicago production...He really leans into this part, throwing himself out there with the abandonment of youth". Platt later reprised his role as Elder Cunningham on Broadway at the Eugene O'Neill Theatre from January 7, 2014 to January 6, 2015. In 2012, Platt had a supporting role in the musical comedy Pitch Perfect, loosely based on the non-fiction book Pitch Perfect: The Quest for Collegiate A Cappella Glory. Platt played the magic-obsessed Benji Applebaum, alongside an ensemble cast comprising Anna Kendrick, Skylar Astin, Rebel Wilson, Adam DeVine, Anna Camp, and Brittany Snow. The film emerged as a major commercial success and received mostly positive reviews from critics. He was subsequently nominated at a Teen Choice Awards in the category Choice Movie: Male Scene Stealer for his work. In 2015, Platt reprised his role as Benji Applebaum in the sequel, Pitch Perfect 2. He has since made film appearances in Ricki and the Flash and Billy Lynn's Long Halftime Walk. Platt became attached to Pasek and Paul's then Untitled P&P Project in 2014, participating in early read-throughs and workshops. 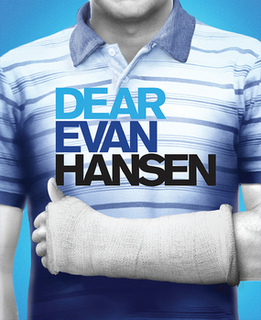 By 2015, the musical, titled Dear Evan Hansen, had begun production in Washington, D.C. at the Arena Stage with Platt originating the titular role. The show premiered on July 9, 2015 and closed August 23, 2015. 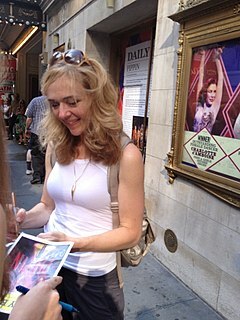 The overwhelming positive reception toward the production and Platt's performance resulted in the show being transferred to Off-Broadway. In 2016, Platt once again originated the role of Evan Hansen at Second Stage Theatre. Platt and the cast played a month of previews, beginning on March 26, 2016, before premiering on May 1, 2016. The limited engagement sold out its entire run with Platt playing his last performance on May 26, 2016. In December 2016, Platt originated the title role in Dear Evan Hansen on Broadway at the Music Box Theatre. Critics hailed his work, calling it "historic" and "one of the greatest leading male performances ever seen in a musical". For his performance, Platt won numerous awards including the Tony Award for Best Actor in a Musical. Platt played his final performance on November 19, 2017. On November 29, 2018, it was announced that Universal Pictures and Platt's father, Marc Platt, secured the film rights to the musical. On March 19, 2018, Platt and Hamilton creator Lin-Manuel Miranda released "Found/Tonight", a mashup of the Hamilton song "The Story of Tonight" and the Dear Evan Hansen song "You Will Be Found". Platt donated a portion of the proceeds to support the March for Our Lives anti-gun-violence initiative, and also performed on stage with Miranda at the rally in Washington, D.C. on March 24, 2018. Platt is set to star opposite Damian Lewis, Nina Dobrev, and Mena Massoud in the Rob Ford historical fiction thriller Run this Town. The casting of Platt caused minor controversy, over allegations that the filmmakers were appropriating the story of female reporter Robyn Doolittle. In January 2019, Platt announced that his debut studio album Sing to Me Instead is scheduled for release on March 29, 2019, and was made available for pre-order along with the songs "Bad Habit" and "Ease My Mind" a few days later. Following the release of his debut album, Platt will embark on his first North American tour, beginning in May 2019. Platt is openly gay; he came out to his family at 12 years old and publicly in 2019, through the music video for his song "Ease My Mind". 2015 Dear Evan Hansen Evan Hansen Arena Stage Washington, D.C.
2017 Will & Grace Blake Episode: "Who's Your Daddy"
Platt was nominated for an Outer Critics Circle Award, a Drama League Distinguished Performance Award, and won  the Obie Award for Distinguished Performance by an Actor and Lucille Lortel Award for Outstanding Lead Actor in a Musical for Dear Evan Hansen's Off-Broadway run in 2016. On May 19, 2017, at the 83rd annual Drama League Awards, it was announced that Platt had won the organization's Distinguished Performance Award. This award, which recognizes a performance on the New York stage in the past year, can only be won once in a performer's career. In winning, at the age of 23, for his work in Dear Evan Hansen, Platt became the youngest winner in the award's history. On June 11, at the 71st Tony Awards, Platt won the Tony Award for Best Actor in a Musical being the youngest actor to win this award solo. ^ "Celeb birthdays for the week of Sept. 24-30". Associated Press. September 19, 2017. Retrieved October 21, 2017 – via National Post. 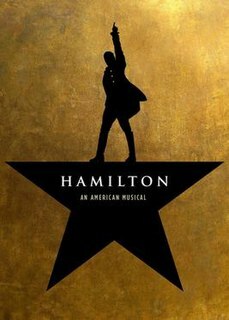 ^ "Tony Awards 2017: Complete Winners List". Variety. June 11, 2017. Retrieved July 8, 2017. ^ Chow, Andrew R. (June 11, 2017). "2017 Tony Awards Winners". The New York Times. Retrieved July 8, 2017. ^ a b "Digging into "The Book of Mormon": an interview with Ben Platt and Nic Rouleau". Depaulia Online. Archived from the original on October 23, 2013. Retrieved October 22, 2013. ^ "Ben Platt Profile". University of Pennsylvania. Retrieved May 17, 2015. 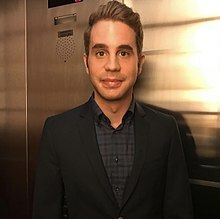 ^ "Tony Award-winner Ben Platt's journey from Camp Ramah to Broadway". The Times of Israel. June 14, 2017. Retrieved April 18, 2018. ^ "Three Camp Ramah Alums Now Have Leading Roles on Broadway. What's in the Bug Juice". Tablet Magazine. July 31, 2017. Retrieved April 18, 2018. ^ "Columbia Nonsequitur Alumni Members". Columbia Nonsequitur. Retrieved May 17, 2015. ^ "Show People with Paul Wontorek Interview: Ben Platt of "The Book of Mormon" and "Pitch Perfect"". Broadway.com. September 9, 2014. Retrieved August 7, 2017 – via YouTube. ^ Miller, Zoe (November 13, 2012). "Ben Platt joins The Book of Mormon on the road". Columbia Spectator Daily. Archived from the original on July 29, 2013. Retrieved October 20, 2013. ^ Hetrick, Adam (December 19, 2012). "Review: The Book of Mormon, With Nic Rouleau, Ben Platt and Syesha Mercado, Opens in Chicago Dec. 19". Playbill. ^ Hetrick, Adam (October 6, 2013). "Review: Chicago Engagement of The Book of Mormon Ends Oct. 6". Playbill. Retrieved November 28, 2017. ^ Reid, Kelly (December 2, 2012). "Review: Ben Platt steals the show as Elder Cunningham in 'Book of Mormon'". The Chicago Tribune. Retrieved November 28, 2017. ^ Hetrick, Adam (January 7, 2014). "Review: Ben Platt, Nic Rouleau and Syesha Mercado Are New Stars of The Book of Mormon on Broadway". Playbill. Retrieved November 28, 2017. ^ "Teen Choice Awards (2013)". Retrieved May 20, 2017. ^ Marks, Peter (June 7, 2017). "How 'Dear Evan Hansen' became one of the most remarkable shows in musical-theater history". The Washington Post. ^ Gioia, Michael (July 30, 2015). "Pasek and Paul's Dear Evan Hansen, About the High School Struggle to Fit In, Premieres in D.C." Playbill. ^ Cox, Gordon (August 13, 2015). "Buzzy Musical 'Dear Evan Hansen' Sets New York Run". Variety. ^ Clement, Olivia (February 2, 2016). "Ben Platt to Star in NY Premiere of New Musical 'Dear Evan Hansen'". Playbill. ^ Gioia, Michael (August 13, 2015). "Following Its D.C. Run, Pasek and Paul's Dear Evan Hansen Will Transfer to New York". Playbill. ^ Clement, Olivia (March 26, 2016). "Pasek and Paul's 'Dear Evan Hansen' Bows in New York". Playbill. ^ Isherwood, Charles (December 4, 2016). "Review: In 'Dear Evan Hansen,' a Lonely Teenager, a Viral Lie and a Breakout Star". The New York Times. Retrieved July 8, 2017. ^ Marks, Peter (June 7, 2017). "How 'Dear Evan Hansen' became one of the most remarkable shows in musical-theater history". The Washington Post. Retrieved July 8, 2017. ^ "Broadway review: Dear Evan Hansen is lit by a dazzling star turn". TimeOut.com. Retrieved August 7, 2017. ^ Clement, Olivia (August 15, 2017). "Ben Platt Sets Departure Date from Broadway's Dear Evan Hansen". Playbill. Retrieved September 11, 2017. ^ Busch, Anita; Busch, Anita (November 29, 2018). "Tony Award-Winning Musical 'Dear Evan Hansen' Will Be Universal Pictures, Marc Platt Film; 'Wonder's Stephen Chbosky May Direct". Retrieved February 14, 2019. ^ Kroll, Justin; Kroll, Justin (November 29, 2018). "Broadway Musical 'Dear Evan Hansen' Getting Movie Treatment". Retrieved February 14, 2019. ^ Milzoff, Rebecca (September 7, 2017). "Dear Evan Hansen Tony-Winner Ben Platt Signs With Atlantic Records: Exclusive". Billboard. United States. Retrieved September 11, 2017. ^ "Ben Platt "Somewhere": GRAMMY Performance". GRAMMY.com. January 29, 2018. Retrieved April 15, 2018. ^ "Alex Lacamoire on Twitter". Twitter.com. Retrieved April 15, 2018. ^ "Lin-Manuel Miranda, Ben Platt release 'Hamilton'/'Dear Evan Hansen' mash-up 'Found/Tonight'". Entertainment Weekly. Retrieved March 28, 2018. ^ Kreps, Daniel (March 24, 2018). "See Lin-Manuel Miranda, Ben Platt Perform at March for Our Lives Rally". Rolling Stone. Retrieved March 28, 2018. ^ "Lin-Manuel Miranda, Ben Platt Perform At March For Our Lives". CBS Miami. March 24, 2018. ^ "Lin-Manuel Miranda & Ben Platt - "Found/Tonight" March For Our Lives Performance". Atlantic Records. March 26, 2018. ^ "Damian Lewis to Play Controversial Ex-Toronto Mayor Rob Ford in Drama". The Hollywood Reporter. Retrieved April 11, 2018. ^ "Damian Lewis to play crack-smoking former Toronto Mayor Rob Ford". The Daily Mail. Retrieved April 11, 2018. ^ "Rob Ford Movie Decides It Doesn't Need Kickass Female Reporter Role". HuffPost. April 10, 2018. Retrieved April 11, 2018. ^ Lenker, Maureen Lee (February 1, 2019). "Ben Platt on his debut album, Sing to Me Instead: 'I definitely wanted to make music that sounded like me'". Entertainment Weekly. Retrieved February 1, 2019. ^ Moynihan, Caitlyn (February 1, 2019). "Ben Platt Sings Out in First Music Video From Debut Album Sing to Me Instead". Broadway Buzz. Retrieved February 1, 2019. ^ "Ben Platt Premieres 'Ease My Mind' Music Video: WATCH". PEOPLE.com. Retrieved February 13, 2019. ^ "Damian Lewis to Play Controversial Ex-Toronto Mayor Rob Ford in Drama". The Hollywood Reporter. Retrieved May 4, 2018. ^ McNary, Dave (January 15, 2016). "Joe Manganiello Joins Alec Baldwin, Salma Hayek's Comedy 'Drunk Parents'". Variety. Retrieved March 28, 2018. ^ "Will & Grace & A Millennial: Watch Ben Platt Do Some Cross-Generational Flirting in New Episode". Playbill. Retrieved October 6, 2017. ^ Staff, Variety (February 5, 2018). "Ben Platt to Star in Netflix Series 'The Politician' From Ryan Murphy". variety.com. Retrieved March 28, 2018. ^ "Ben Platt Chart History: Billboard 200". Billboard. Retrieved March 9, 2019. ^ "ARIA Australian Top 50 Albums". Australian Recording Industry Association. April 8, 2019. Retrieved April 6, 2019. ^ "Ben Platt Chart History: Canadian Albums". Billboard. Retrieved March 9, 2019. ^ "UK Albums Chart". OCC. Retrieved March 9, 2019. ^ a b "Cynthia Erivo, Steve Martin Win 2016 OCC Awards". Outer Critics. Retrieved August 7, 2017. ^ a b Gordon, David (May 23, 2016). "Ben Platt, Lupita Nyong'o, Georgia Engel, and More Win 2016 Obie Awards". TheaterMania.com. Retrieved August 7, 2017. ^ a b Lefkowitz, Andy (May 5, 2017). "2017 Lucille Lortel Awards: The Band's Visit, Ben Platt & More Named Winners". Broadway.com. Retrieved August 7, 2017. ^ a b Smart, Jack (May 19, 2017). "Ben Platt Becomes Youngest-Ever Winner of Drama League Award". Backstage. Retrieved May 27, 2017. ^ a b "Tony Awards 2017 updates: 'Dear Evan Hansen' and Bette Midler are among the night's big winners". Los Angeles Times. Retrieved August 7, 2017. ^ "Grammy Nominations 2018: Complete List". Variety. November 28, 2017. Retrieved November 28, 2017. ^ "Ben Platt and Dear Evan Hansen Cast Receive Daytime Emmy Nomination". Theatremania.com. Retrieved March 28, 2018. ^ "THE NATIONAL ACADEMY OF TELEVISION ARTS & SCIENCES ANNOUNCES NOMINATIONS FOR THE 45th ANNUAL DAYTIME EMMY® AWARDS". EmmyOnline.com. Retrieved March 28, 2018. Second Stage Theater is a theater company founded in 1979 and located in Manhattan, New York City. It produces both new plays and revivals of contemporary American plays by new playwrights and established writers. The company has two off-Broadway theaters, their main stage, the Tony Kiser Theater at 305 West 43rd Street on the corner of Eighth Avenue near the Theater District, and the McGinn/Cazale Theater at 2162 Broadway at 76th Street on the Upper West Side. In April 2015, the company bought the Helen Hayes Theater, a Broadway theater. Benj Pasek and Justin Paul, known together as Pasek and Paul, are an American songwriting duo and composing team for musical theater, films, and television. Their works include A Christmas Story, Dogfight, Edges, Dear Evan Hansen, and James and the Giant Peach. Their original songs have been featured on NBC's Smash and in the films La La Land, for which they won both the Golden Globe and Academy Award for Best Original Song for the song "City of Stars", and The Greatest Showman. Their work on original musical Dear Evan Hansen has received widespread critical acclaim and earned them the Tony Award for Best Original Score. Justin Paul is an American theater and television composer and lyricist. Michael Greif is an American stage director. He has won three Obie Awards and received four Tony Award nominations, for Rent, Grey Gardens, Next to Normal, and Dear Evan Hansen. 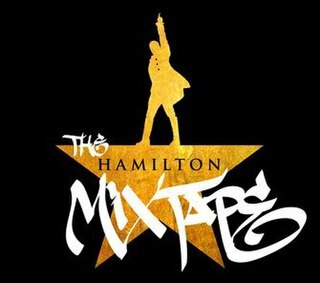 The Hamilton Mixtape is a 2016 mixtape album featuring assorted songs from the 2015 Broadway musical Hamilton performed by various artists, as well as some deleted songs from the musical. It was widely well-received by fans and critics alike. Steven Levenson is an American playwright and television writer. He won the 2017 Tony Award for Best Book of a Musical for Dear Evan Hansen. Justin Goldner is an American music producer, songwriter, arranger and session musician based in New York City, originally from Philadelphia, Pennsylvania.